With our last Nairas we managed to get to the airport, where we spent our last Euros to pay for excess luggage caused by the heavy video equipment. 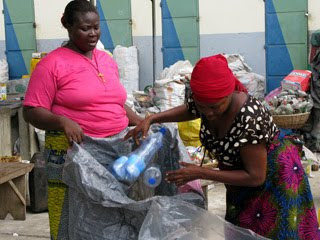 We wore our recycled waste caps from Accra, and everybody was smiling. The lady at the customs wanted my cap, and I promised her: “Next time!”. She was satisfied, and I could pass. At 10:30 a.m. our plane left Lagos, bringing us back to the European cold. 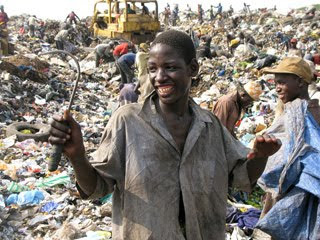 We were driving all the way from Austria, Italy, Morocco, Mauretania, Mali, Burkina Faso, Benin, Togo, Ghana and Nigeria to explore different cultures and socio-economic realities via the Trash of Your Society (T.O.Y.S. ), bringing our own trash from Austria in exchange. We explored the different definitions and values of what is called trash in our own country. 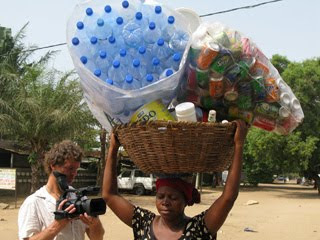 We found out, that certain items thrown away in Austria are real treasures in the deserts of Mali, where people were fighting over our PET-bottles, which are basis of transaction for many self-employed entrepreneurs all along our route. We found metal-recycling cooperatives, local and international NGOs, scavengers melting lead and copper out of otherwise useless electronic equipment from Europe and the USA, or restoring und re-selling things they find in the waste. We found artists, who transform waste into sculptures, installation and designer fashion. It started to hurt throwing away things we knew by now that they are precious for our entrepreneurs, like plastic- or glass bottles, metal cans, old clothes… It was shocking to see, how greedy children grabbed for a mango peel recklessly thrown away, or a crumble of sugar; to see people eating from the dumpsite, together with cows, goats and sheep. 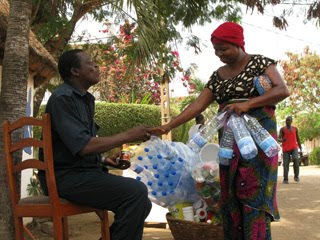 And of course we started to value water, which is not available in sufficient quality and quantity for so many people along our way. At the end we learned, that real progress is possible, when the government is interested in making things better for their people. 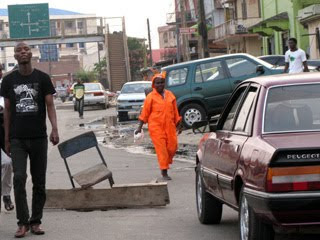 In 2005, I experienced most districts of Lagos as a huge dumpsite, now you see the LAWMA-staff in their orange overalls cleaning up the streets all over the city. Most of all, we found wonderful trash dividends for our lucky shareholders. 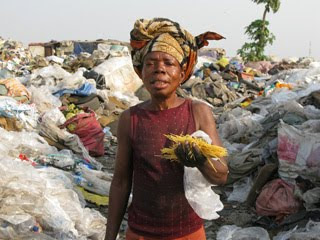 A work by trash-artist ASTON from Cotonou will be raffled off between all our shareholders at the AGM (Annual General Meeting) of our up-and-coming company. O.N.G. Auve-garde des plages de la baie du levrier, O.N.G. Arbre, O.N.G. Zazou, Martial Pouret and Sophie (Mauretania), Momo le Magnifique, Cooperative des Forgerons et Ferblantiers Jama Jigi Marche Medine, Mamadou (Mali), Oxfam Quebec, Jaqueline Djidonou, ASTON (Benin), Mike Anane, John Owoo, Tei Mensah Huagie - Not a Waste Recycling Studio (Ghana), LAWMA, Akintunde Akinleye (Nigeria), Wendelin Schmidt (D) and many others. 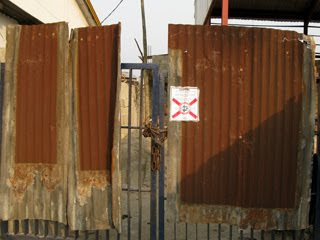 Finally at LAWMA – Lagos Waste Management Authority. 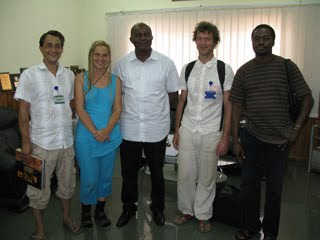 Managing director Ole Oresanya welcomed us in his office. 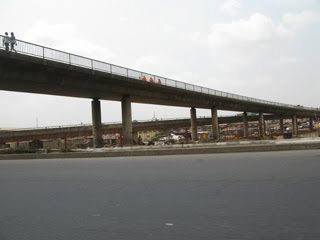 What happened to Lagos within the last years? 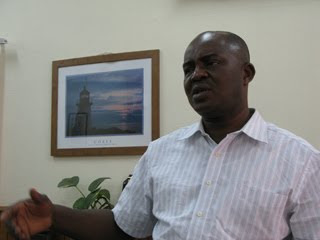 Mr. Oresanya confirmed, that Lagos had a huge waste-problem several years ago. 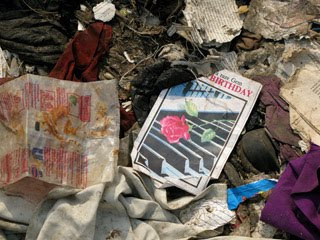 The city now has about 18 million inhabitants, which means: when everybody drops a piece of paper a day, it makes 18 million pieces of waste! 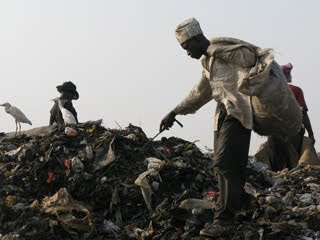 Since the democratisation of Nigeria in 1999, the government decided to make a plan to keep Lagos clean, as lots of waste means more frustration, more aggression, and more crime. Together with LAWMA, the government developed a concept for efficient waste management, and since a few years, it really works. 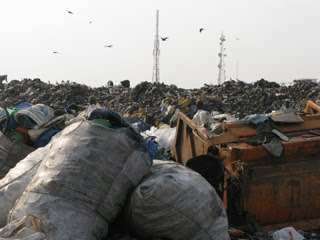 Lagos generates about 9,000 metric tons of wastes daily (0.5 kg/person/day), 80 percent of this waste can be recycled. Under the city’s recycling initiative called ‘zero waste programme’, organic waste, which makes up 60 percent of the city’s waste is being recycled into compost. 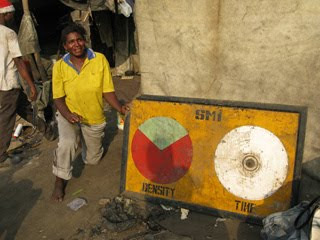 This is used for a green programme aimed at beautifying the city with trees and flowers. 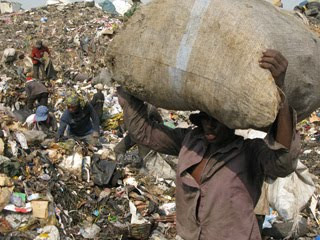 Additionally, Oresanya is looking at waste as a tool of job creation and poverty reduction. 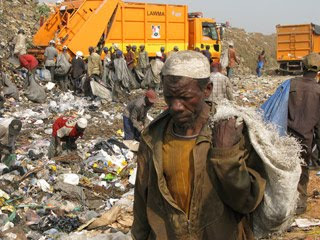 LAWMA didn´t have half of the lorries they needed, so they included private companies to bring the waste to the dumpsites. In the meantime, they have almost half the lorries they need - around 500. Joachim will write more about LAWMA. We went to their biggest landfill in Ojota, Lagos to interview the scavengers there, together with Nigerian photographer Akintunde Akinleye. 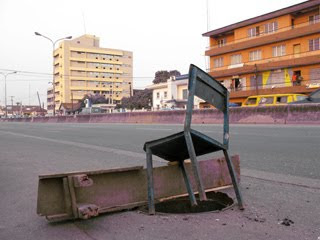 After arriving, the geologist of LAWMA was about to go to a meeting. Quickly she explained, that the smoke coming out of parts of the dumpsite due to the high pressure of waste will be used for methan gas production soon. 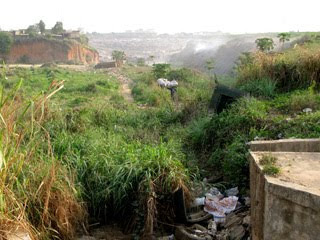 There are about 2000 scavengers collecting useful waste on Ojota dumpsite every day. Some of them live there, some just go there to work. Many of them come from other Nigerian states. They are all independent contractors, working under highly dangerous conditions: caterpillars and lorries are rolling between people who try to grab the most precious things before the others get them. 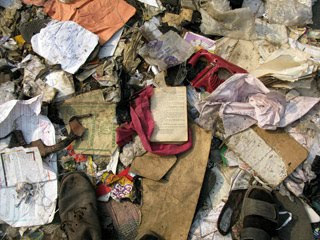 The scavengers are mostly specialised: some on collecting cloth, plastic, metal or paper, some collect suitcases and bags, repair them and sell them on the nearby second-hand market. 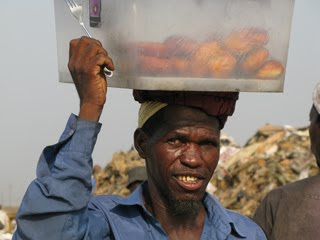 E-waste is not allowed on site, but some does appear from the general waste collected all over Lagos. People are cooking and eating between the waste, white birds join them. Patricia, one of the scavengers, offered to cook pasta for us. Some people did not want us to take photos of them, they were afraid, that their friends and family might find out, where they work. 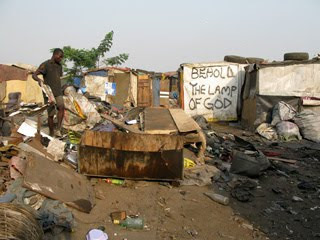 Some were really proud of their work and appreciated us being with them in the waste and bad smells. When I started to collect dividends for our lucky shareholders, they started to respect us being one of them – although a bit stupid, because we did not collect the “valuable” waste. The meeting with LAWMA director was postponed to Wednesday, so we decided to visit Heinrich Böll Foundation and Goethe Institute in search of possible partners, who could help us with shipping our dividends, and maybe help us to bring the exhibition to Lagos. With Monika Umunna of Heinrich Boell Foundation we discussed CO2 emissions in Africa: We have seen so much fire and smoke from Benin to Togo, Ghana and Nigeria, but there is no measuring, no statistics, no awareness. 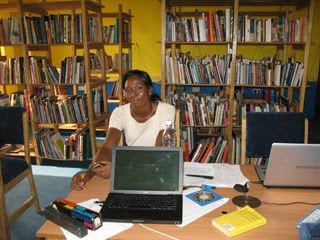 Then Monika introduced us to the staff of Goethe Institute, which is located in the offices of Boell Foundation until they can move to their new building in March. 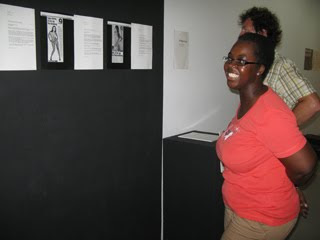 After this, we decided to visit CCA Lagos - Center of Contemporary Art, run by Bisi Silva. 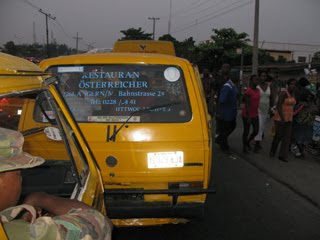 We could not afford expensive taxies, so we went to take a “Danfor” – small, yellow VW-busses, the public transport of Lagos. They take 8 passengers. After half an hour of waiting with locals, most of them disappeared and advised us to go a few stops back, because all Danfors coming to this stop were packed with people already and did not take more. 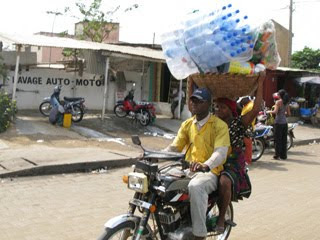 We went to the big street to stop a motorbike taxi – we had good experiences with this way of transport from Cotonou. No, they are not allowed to drive out of their own district. They would do it anyway, but it would cost around Eur 15,- for both of us, thank you. For Eur 1,- they would bring us to a better bus stop. On the way, they asked every Danfor-driver if he would go our direction, and soon we were on our way. After this inspiring visit we took a walk in the quarter, collected some dividends, and then took a Danfor back to our hotel – in the go-slow time between 6 - 8 p.m., and it took us precisely from 6 – 8 p.m to get there. Later in the night, we visited the Fela Kuti Shrine. 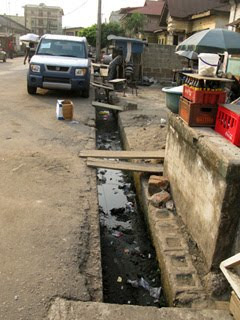 Resumee of our day out: The waste on Lagos streets is disappointing. 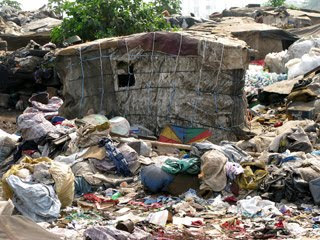 My inspiration to start the project was a visit in Lagos in 2005, where I was impressed by the huge amounts of trash on all streets. 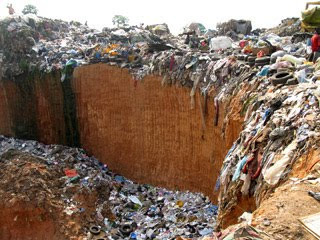 This was the El Dorado of waste, here I wanted to return and explore. 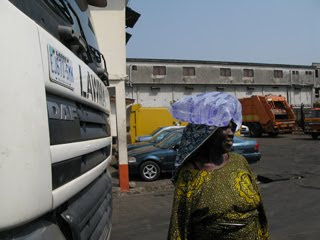 And now: almost nothing, except the LAWMA-women in orange overalls, brushing and collecting waste everywhere we were going. 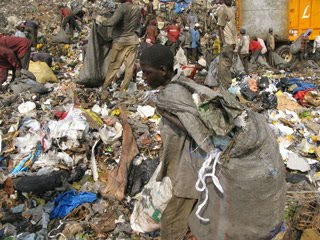 Tomorrow we finally would meet the LAWMA-officials, find out what happend, and then visit their huge landfill. 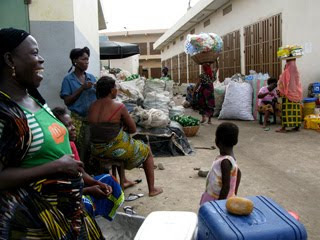 The distance between Cotonou and Lagos is about 80 km, so we were convinced – considering all expected troubles at the border -, that we would arrive in Lagos around 10 a.m. when starting in Cotonou at 6 o´clock in the morning. We expected some small troubles: Manuel had lost his vaccination card, and the stories we heard from Maryam and Joachim were not really promising. 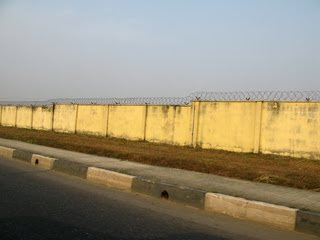 We arrived the Nigerian border quickly. We had to get out of the taxi, I went barefoot because of the huge blisters on my feet. People offered me their sandals, but no way. A long row of tables, we had to go from one to the other for control: passport, visa, vaccination card, drugs, customs… On every table somebody new who asked, why we did not get our visa from Vienna, but from Cotonou. 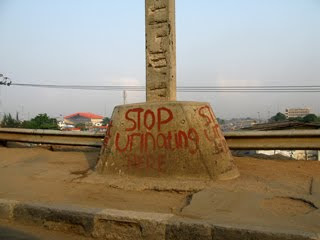 Why we want to go to Nigeria. Obviously, they were looking for something to make us pay, we observed a constant stream of money, going into the officer´s pockets. Manuel was stopped at the first counter because of his missing vaccination card, and after a not too small payment he was allowed to pass. A few counters later he had to pay again. 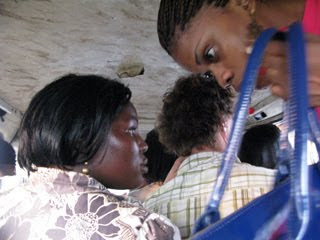 We continued in a Nigerian taxi. The driver charged a huge amount of money, because we are white, and this means: more police controls than usual, more troubles. Our Benin driver had charged money from him to hand us over, and there was some fight we did not understand between people we had never seen before. 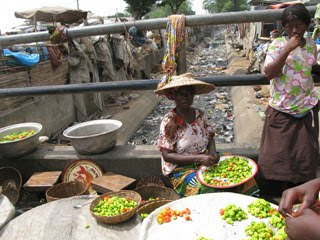 They passed money around, and finally we could go: Welcome to Naira land. After some hundred meters we had to stop for the next control. The car before us did not stop immediately, the policeman was beating on it with a golf club. Everybody had weapons – heavy guns, small guns, knifes, golf clubs, metal claws… We felt a bit uncomfortable. There were stops every 5 minutes, Manuel had to pay for his missing vaccination card again, and some stops later they wanted to have money for a mask Stefan bought in Mali. It was a souvenir-shop Dogon mask, obviously new, but they wanted to charge money for an antique. Endless discussions, they wanted Eur 30,-, this was more than the money he paid for the mask. Stefan could not pay, they wanted to keep the mask, not even Susanne Wenger could help… Finally we said, we would leave it with them, but we want official papers, so we could claim it back. 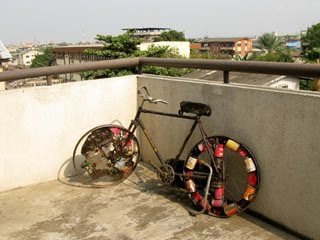 We could keep it for 1000 Naira, which is around Eur 5,-. 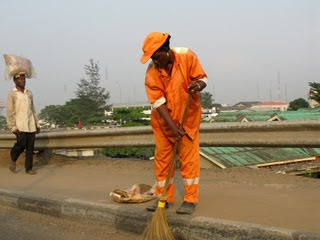 During all this horror drive I observed mostly women in orange overall, cleaning the streets. 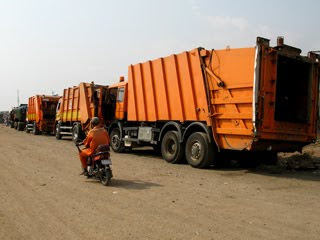 They had the logo of LAWMA on their clothes – Lagos Waste Management Association. Joachim and Maryam had been there already, the director expected us to come with the video camera. I was too shocked with all this police controls to take any pictures of the waste workers. There was police everywhere, and cameras definitely would give them another reason to make us pay. We finally arrived in our hotel at 1 p.m. – exhausted and frustrated. We did not feel like going anywhere, the country seemed to be hostile. The taxi driver was complaining all the way about mismanagement and too much police, traffic jams and controls everywhere. We had the first hotel room with air condition, so we switched it on and went to bed. 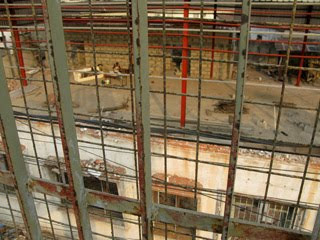 The hotel had high walls, barb wire and a strong gate, protected by a guard day and night. We felt secure. After a short nap, I wanted to contact my friends in Lagos and check emails, but there was no internet and no phone to the outside world. After checking the hotel nextdoors, we found out that it had internet, but was much more expensive, so I looked for an internet café nearby. People on the street were helpful and friendly, quiet atmosphere. The internet café was close, the hotel manager gave us his own sim card for our cell phone, and we could start to organize our stay. We called Mr. Bode Fanima of LAWMA, and he visited us at 10 pm for a drink and talk. 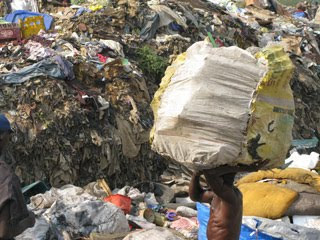 He promised to arrange a meeting with the executive director, and a visit on their biggest waste disposal site: the waste dump of a city with 18 million people – we were excited! Stefan started to pack his own stuff early in the morning, then we put all dividends into recycled metal cases, which will be sent to Austria as soon as we have raised enough money for shipping. Then we said good bye to our home of the last months. 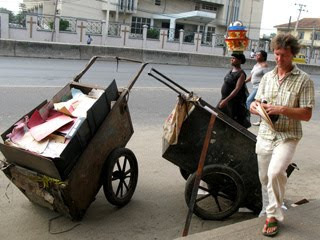 The truck with its rich load of dividens can stay at the German Embassy in Cotonou for the next few months. Instead of leaving for Nigeria as planned, we felt weary and tired and decided to leave early next morning. We were packing at about 40 degrees Celsius heat, so there was not much energy left. Nevertheless, there were 2 big bags of our own waste left from the journey, and all the Austrian waste we brought and nobody wanted. It was not too bad for 3 months of journey, but considering the small dustbins of Manuels girlfriend´s house where we stayed for our last days, it was quite essential. 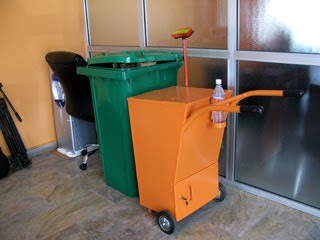 Waste production in African households is incredibly small, for an apartment house with 3 floors there was only 1 medium sized dustbin, which is emptied once a week, and this is usually sufficient – but not, when you have European guests. 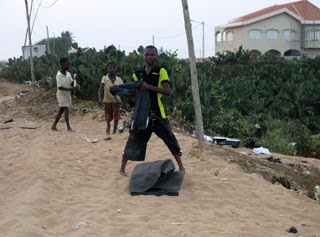 We decided to make a final Benin shot and burn our trash on the beach – as we had observed local people to do regularly. Where ever you look, there is a fire burning waste. 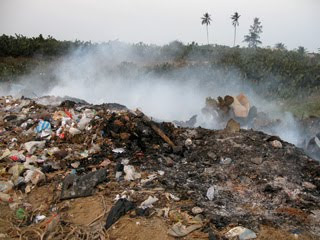 It was Sunday evening, and the beach was crammed with people enjoying the sunset – and a big fire of waste burning on the side of the road. We were curious about the reaction of people when they see us – white people – burning trash the same way they do. What would happen? We stopped and put our waste out of the truck. Manuel drove the truck away. The situation was not discussed before, and it was quite confused. Stefan asked me to throw the waste into the fire, but I did not feel comfortable with the idea, so he started to film the sunset. After a short thought, I decided to take a bag anyway and throw it into the fire. The bag was heavy, and I went too close – the ground was loose with ashes, and I slipped right into the embers, wearing only sandals. My toes burnt like fire. I tried to get out of the ashes, but trying this I was sliding even deeper, so I let myself fall down and crept out. In the meantime, some children had taken our other bag and started to fight over its content. 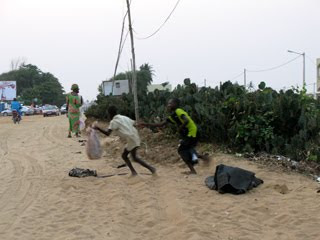 Then some barefoot children ran into the hot ashes and pulled out our bag. A car passed by, the driver shouting out to us fiercely. I was looking at my toes, shocked and convinced, that I would not be able to walk for the next days. Not knowing what to do, I took some pictures, while Stefan was filming the children and Manuel came back talking to a man he just met. I decided, that it hurt to much and asked Manuel to bring me to a doctor. Stefan hanging on the outside of the truck, we were driving back into the city for a pharmacy, where Manuel got me a salve. Then we went back to the apartment, and I spent the rest of the evening with my feet in iced water, while Stefan cooked a nice meal. 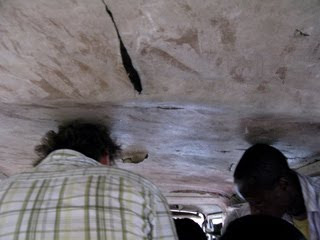 Manuel tried since noon to find a taxi to pick us up at 5 o´clock in the morning to bring us to the Nigerian border. He made countless phone calls, at the end we had 3 taxi drivers competing. None of them would bring us over the border. At 2 a.m. Manuel finally fixed an appointment with a driver from Porto Novo, who would hand us over to a Nigerian driver at the border. At 9 a.m. we were at the quarter´s bottle storage to wait for Celestine, who came with baskets full of bottles, then went away to collect some further goods. The other women helped her to built a huge tower, which she put on her head, an on we walked. While in the quarter, Celestine still stopped to ring up households, and then we came to the big street, and instead of walking, we stopped 4 “zemidjans”, the moped taxies. 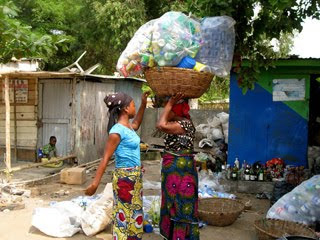 We filmed and took pictures while driving, and on the market Celestine went to the Oxfam headquarters to sell her goods. 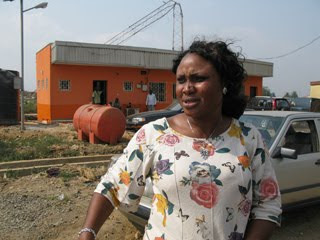 She got cfa 2.000,- (Eur 3,50) for her collection, which she bought for cfa 1.600,-, walking from house to house for hours. This made a wage of cfa 400,- for a whole day´s work – not even 1 Euro. We doubled up the cfa 2.000,- and bought some of the bottles for the exhibition and one of our lucky shareholders. With our budget, we could not do more. 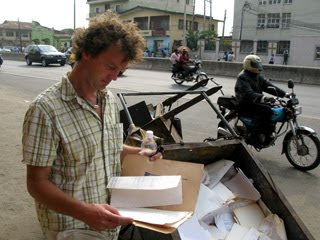 In the afternoon I started to pack my stuff from the truck, we had to leave it in Cotonou. Stefan went to Aston to exchange a painting by Schaumbad artist Michael Maier for a work by Aston – we had discussed this at our last visit. 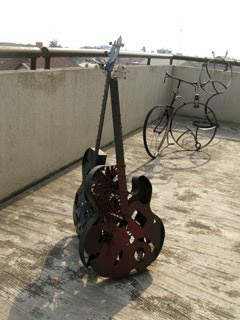 Stefan came back with a great picture plus a small sculpture, which will be raffled of between our lucky shareholders. 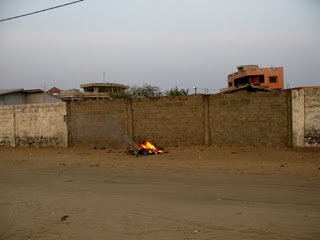 While packing, somebody started to burn their waste on the street.